Yesterday, I wrote about releasing habits and mental-emotional patterns through questions based on the Five Precepts of reiki. This morning, I got thinking about the process of manifestation or creation of something in our lives, whether internal or external. So, here’s a set of questions to guide us through the creation process. Once again, use your journal, a trusted friend, an oracular tool, a therapist, or council circle to respond honestly to the questions, then act and speak in ways that resonate with your explorations. Let these ways of acting and speaking lead you to your inner and outer goals. Fill in the blanks with the name of your vision, goal, or desire. How can I detach from anger as I create _______ in my life? How can I detach from worry as I create _______ in my life? What does creating _______ humbly look like for me? What does creating _______ honestly look like for me? How can I demonstrate compassion with myself as I create _______? How can I demonstrate compassion with others as I create _______? Today, I taught the first day of a two-day Second Degree reiki class. The afternoon session focused on clearing mental-emotional patterns and letting go of unwanted habits. Based on the Five Precepts of reiki, here are some questions for reflection, journalling, or discussion with a trusted person in your life. Fill in the blank of each sentence with the name of the habit or pattern you choose to release. When you’ve explored each question as thoroughly as possible, act and speak according to what emerges. How can I detach from anger as I release _______? How can I detach from worry as I release _______? What does releasing _______ humbly look like for me? What does releasing _______ honestly look like for me? How can I be compassionate with myself as I release _______? How can I be compassionate with others as I release _______? What we focus on grows and thrives. Three tarot decks — Medicine Woman, Gaian, and Motherpeace — resonate with my current goals. They depict people living sustainably and successfully. They show individuals, groups and situations in whom/which the split between earth-caring and modern living has been healed. There’s a sense that another culture is possible. Perhaps, if I meditate on, use, and write about these three card packs enough, I’ll contribute to the healing of the rift between my inner comfort creature and my inner earth-lover. If I use these decks and others like them with enough clients and workshop participants, perhaps that healing will ripple out into my community. That’s something I’d like to see thrive and grow. What tarot deck(s) or other tool is most aligned with your current goals and visions? Why? Remembering our connection with Nature. Remembering our connection with the Feminine. If these ideas resonate in you, please support my friend Wendalyn’s project, Sound Dreaming: Oracle Songs from Ancient Ritual Spaces. One of the fundraising goodies is a series of four consultations with me. Please look for it. Please support this worthwhile project however you can. I tend to carry at least one tarot deck with me wherever I am, so I’m ready to do some insight work or manifestation processes wherever I might be. If you didn’t have a set of cards, how would YOU enjoy your journey through Tarot for Manifestation? 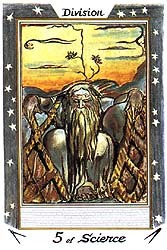 Today, my Card of the Day, from the William Blake Tarot of the Creative Imagination, is the 5 of Science. The keyword assigned to it by Ed Buryn, the deck’s creator, is “division”. It would be so easy to get caught in a mental panic about separation, creating wedges between myself and other people, isolation, and assigning blame for relational rifts. This, however, would not be constructive. Certainly it’s good for me to reference these ideas as how not to be in the world today. But there’s more. I sat with the card and reflected on how it is true in my life and how its concepts might be helpful strategies. First, I had already done some journalling this morning about how not to be divisive, even unconsciously, with people in my life. I wrote about a certain energy that I didn’t want to be wedge between me and others in order to bring this energy to consciousness, to name it so it could not have power over me and my interactions. This brings me to the second point about today’s card, its number and suit. Fives, for me are about change. The suit of Science can be about, among other things, thoughts and communication. So the card suggests that I choose to change my thoughts and words in order to change my interactions. True, in light of my earlier journal writing session. Third, I’m offering a Tarot for Manifestation workshop in Oakville this evening, so the Five-ness and Science-ness remind me to adjust my language or wording according to those who are present. Then I thought about “division” as a helpful strategy (I like proactive tarot!). To divide something into smaller bits is often a good way to avoid being overwhelmed or to make a situation less confusing or messy. If I’m making hummus and my food processer only takes so many chickpeas, I need to mix it in smaller batches so the machine won’t clog up and give me an inferior product. Applying this constructive point of view of division to my day, it may be helpful for me to break down communicational/educational tasks into manageable pieces. Don’t bamboozle this evening’s participants with too much at once; make sure that the process’s individual components are presented clearly, one at a time. All of this to say that pictures aren’t the only symbols on tarot cards and other tools of insight. Words are also symbols. We need to be careful about being literal with them all the time. While division is sometimes an unpleasant split, it can also be a sensible way to get things done. If the deck you’re using has keywords printed on the cards, really check in with yourself about a greater spectrum of possible applications of a card’s keyword. Take it to the worst-case scenario, then the best-case scenario, then be honest about which end of the scale is most likely true for you in the moment. You’ll hold a more balanced perspective and you’ll learn more about the card and yourself.